This EA trades untested breakouts of variable periods when the market is orderly and behaving in a predictable fashion. It is oriented towards short-term trading and relies on the fact that volatility increases by orders of magnitude when the market reaches previously untested price levels, allowing for a quick profit or a small loss based on a time expiration. The EA performs well in orderly markets and suffers in very small timeframes or thinly traded instruments. Don't be afraid to experiment with different settings based on the setfiles. Backtest in M1 HLOC mode. Don't trade any other EA in the same symbol. Be patient, the EA only trades when it finds a suitable scenario. Try to never unload the EA to assure the atomicity of the strategy. There is no need to set a different Magic Number to trade different symbols. Trade from a VPS or leave your trading computer turned on 24/5. High spreads will decrease the trading frequency of the EA. The EA trades using pending orders at bar closing. The EA will not trade if a weekly or daily gap has not been closed. The EA sets appropriate stop-loss and take-profit orders based on market levels. The EA will by default close all pending orders on friday night and end the week flat. Trading Direction: Choose if you want to buy, sell or both. - Most Breakouts: The EA will trade most breakouts it detects, even outside a predictable range. - Detected Ranges: The EA will trade only if it detects a trading range. All trades will have a suitable take-profit. - Confirmed Ranges: The EA will trade only after a trading range has been confirmed. Less trading frequency but more quality. Lookback: Amount of past bars to iterate looking for suitable ranges. A higher value will produce more, yes less reliable trades. 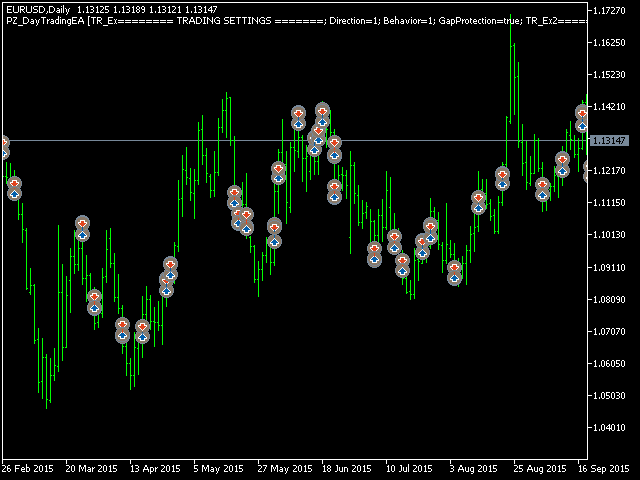 Entry Range: Minimum range of bars to be broken to take a trade. A lower value will produce more, yet less reliable trades. Exit Range: Minimum amount of consolidated bars needed to find a suitable stop-loss. A lower value will produce more trades. Expiration: The expiration time for losing trades. Filter: Amount of timeframes the EA looks up to confirm trading levels. A higher value will produce less, yet more reliable trades. 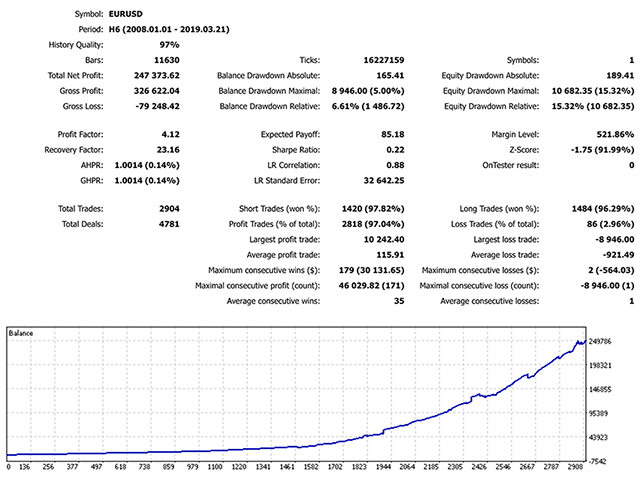 Break-even: Profit in pips at which the EA moves the stop-loss above/below the open price for the first time. Must have value. Trade Asian Session: Enable to trade during asian session. Trade European Session: Enable to trade during europe session. Trade American Session: Enable to trade during american session. Trade on Monday, Tuesday, Wednesday, Thursday, Friday and Sunday. Close orders on Friday Night: Enable to close orders on Friday night. Money Management Behavior: Choose if the EA must trade a manual lot or auto-calculate the lot-size. 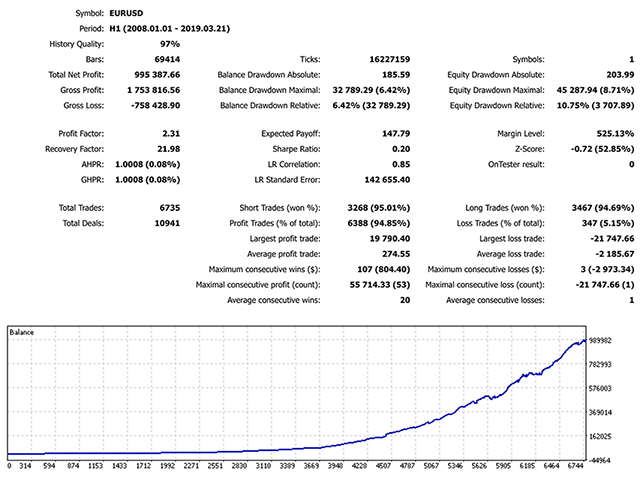 Risk Allocation: Percent of free margin risked on each trade, if money management is automated. Manual Lot Size: Size of each trade, if money management is disabled. NFA/FIFO Compliant: Enable to trade with US Brokers or netting accounts. Custom Comment: Enter your custom comment for trades. Slippage: Maximum slippage allowed for trades. Do not set below 10 points or it is ignored by the broker.